For a robust distinctive look the Hunter Douglas range of wide panel ceiling systems, provides ceiling designers with the ability to create a wide range of finishes. Exterior wide panels with widths up to 300mm and lengths up to 600mm mean fewer joints and reduced installation costs, allowing designers to create imaginative designs over large expansive areas. 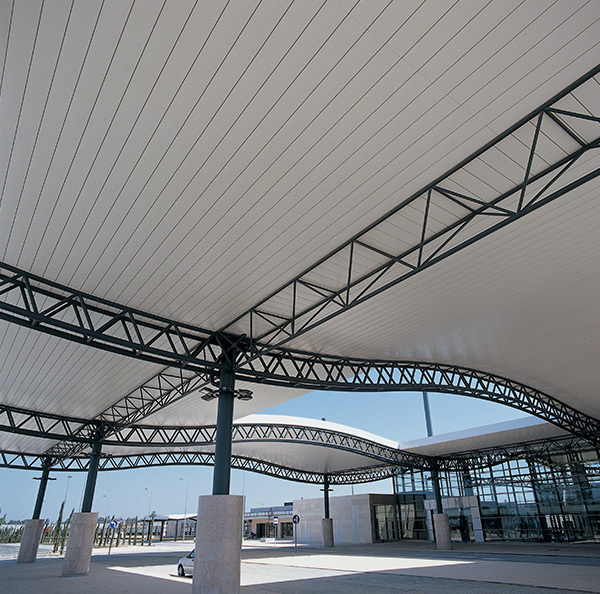 For a big impression, without a big cost, our exterior wide panel ceilings are the perfect choice. Wide panel ceiling systems are perfect for large spaces. Using panels of either the same or varying length, a range of looks can be achieved. All of these looks are sleek, minimal in design, easy on the eye, yet a striking addition to any area. The panels simply lock onto the carriers, without the need for additional locking clips. Hunter Douglas wide panels are available in widths up to 300mm and in lengths up to 6000mm. 300C panels have a 5mm bevelled edge, while 300L panels deliver an even smoother design with square-edged panels. 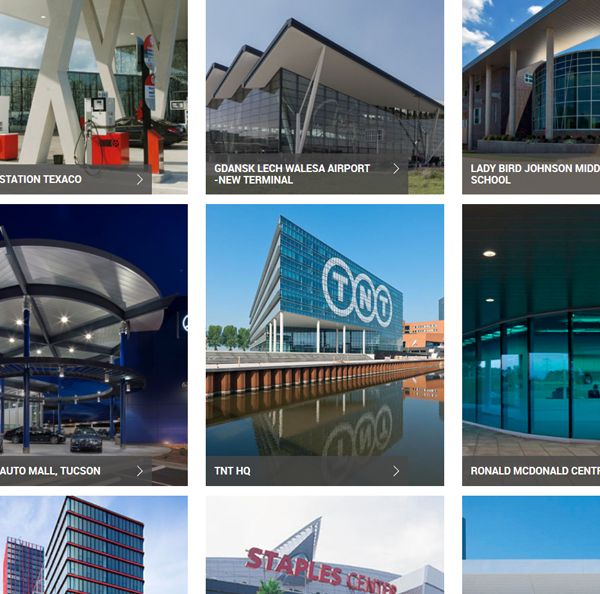 Hunter Douglas external metal ceilings are available in a wide range of standard colours. All our exterior ceilings, receive the Luxacote® Exterior Coating to enhance the ceilings strength and durability. We also supply a special range of finishes and colours for bespoke projects. For further information on our extensive range of external ceiling applications and the colours and finishes available, please contact our sales office. Our focus on quality (ISO9001 and TAIM certified) ensures the highest standard of production processes, material, machinery and finished product. The superior durability of Hunter Douglas products translates into lower costs during the life cycle of the product. 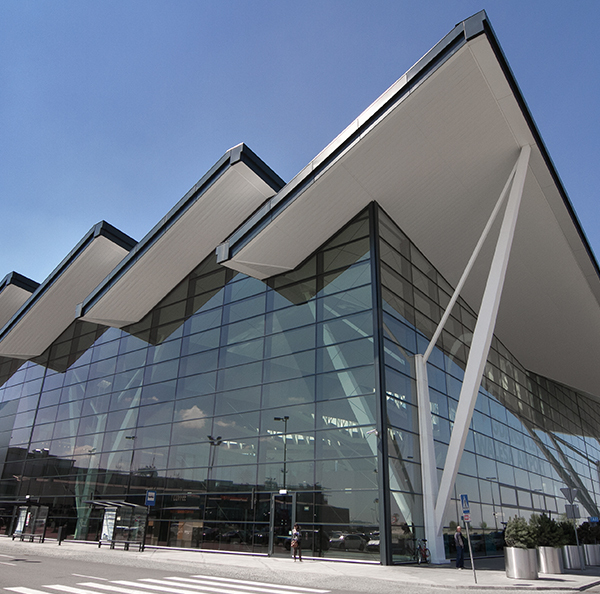 Our Exterior Ceilings have been extensively tested against varying wind loads by TNO, the Netherlands. Wind load calculations allow us to easily use our span tables. These tables support the engineer in developing the optimal and most economical hanging construction for the designed exterior ceiling. Use the filters below to browse our full selection of Wide Panel Products.